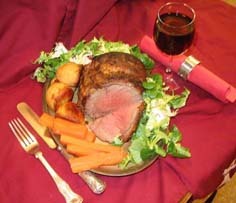 Naturally reared beef - tastes like beef used to - and favoured by those who love good eating. We produce prime quality grass-fed Highland Beef, from pedigree Highland Cattle, Scotland's best known and oldest native breed. 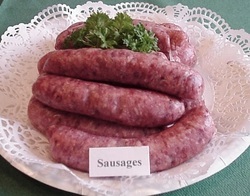 Being primarily grass-fed as opposed to a grain based diet, the meat is particularly nutritious. Sourcing - our cattle are allowed to grow and "finish" in their own time, and here they are generally ready for slaughter at between 22 and 36 months of age - a bit older than modern day commercial cattle. This is why it is not always easy to find a place to buy guaranteed purebred Highland beef as most beef farmers prefer to work with the big continental cattle and their crosses which are faster growing. Highlanders are not very big cattle, but what they lack in size and speed of growth, they more than make up for in eating quality. Highland Beef is outstanding for its flavour, tenderness and fine texture, without much outer fat but well marbled for succulence. 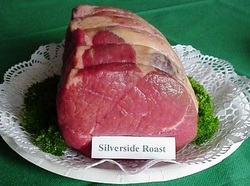 Our sides of beef are matured in a chill for three weeks before cutting, to enhance flavour and tenderness. This also reduced shrinkage during cooking. Cuts include steaks, traditional roasts, casserole meat, braising, mince - everything for tasty meals and to suit your preference for fast or slow cooking. Availability - occasionally during the year. Customers are also very welcome to visit us at the farm, by prior arrangement please. Price lists can be sent on request. Click Contact for more information. When you buy from us, you do so with full confidence that you are buying the best that nature and Scotland can provide. On Mid Torrie Farm we specialise in breeding quality Highland Cattle to the highest standards of welfare we can manage, and run the farm with wildlife and biodiversity in mind. 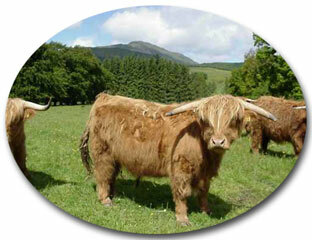 For more information on our Highland Cattle and details of farm visits please click Our Highland Cattle.